Here we have an American Barleywine that was first brewed in 1975 (predating Bigfoot by almost a decade). That blows me away, especially considering the dire state of the American brewing scene in the dark days of the mid-70s. It's a rare thing to find an American beer that's been available for 35 years, even more so a good one. While Old Foghorn is truly a founding father of the American scene, it was inspired by a trip Fritz took to England in 1975. He was so taken by the traditional brewing processes he saw used and the Barleywine style he discovered that he got right to work on Old Foghorn as soon as he got back. Anchor is a known for their vagaries, and plenty swirl around Old Foghorn. They list the alcohol content at 8-10%, leading me to believe the recipe shifts a little each year. I know for sure that the recipe for their Christmas Ale changes each year, but I have yet to find a solid answer for Old Foghorn. With that in mind, I've decided to put up just one review for this beer, instead of yearly installations. To be safe though, I want to mention that the notes below were taken from a six-pack bought in early 2009. As for ingredients, Anchor only reveal that Two-Row barley makes up the backbone and that Cascades are the only hops employed (this was actually one of the first commercial uses of Cascades). The beer is dry hopped for nine to eighteen months with additional Cascades after brewing for an extra splash of hops. Only the first run of the mash is used for Old Foghorn, so it actually takes three mashes to get enough wort for just one batch. The beer also undergoes bunging (stop laughing!) to give it what Anchor describe as "champagne-like bubbles." Another question up for debate is American Barleywine vs. English Barleywine. I've seen this described as an English-style, probably due to the the facts that this is such an early attempt that the American style had not evolved yet and that Anchor themselves describe it is as being "based on traditional English barley wines". However, based on the facts that this is the beer that kicked off the American Barleywine and that it is hopped exclusively with Cascades, I'm going with American. Let me know if you disagree. Because of the high original gravity, the yeast is unable to ferment all of the sugars. As a result, [Old Foghorn] is high in alcohol, and is slightly sweet, due to the residual sugars. Old Foghorn also has a pleasant hop bitterness, due to the large quantity of hops used during brewing, and a unique hop aroma due to the dry-hopping and aging. Alright, that's enough rambling (I can't help it when we're talking about Anchor! )—let's get tasting. Appearance: A deep red-brown body with two fingers of off-white head that leaves patchy lacing. Aroma: Rich, toffee malt with lots of banana notes (more like actual banana than artificial). Once the head breaks, the banana-pudding fades a bit and the booze really shines. Taste: Dark fruit over an assertively solid toffee malt backbone. This is reminiscent of a rich desert. There are some definite hop notes in here. While the alcohol profile is pretty big, it compliments everything perfectly. In the end, a boozy, fruity aftertaste. Mouthfeel: Medium-full and silky-smooth with moderate carbonation. You can really feel the booze in your throat. Drinkability: Very tasty, but the alcohol will slow you down eventually. 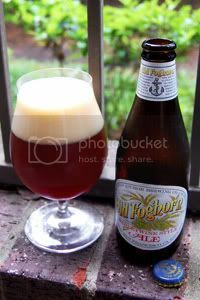 Verdict: Old Foghorn is truly a great beer, and it's clear why it has been brewed for over thirty years. Like a boozy, rich desert, this is a perfect beer for after-dinner contemplation. If you're looking for a starting point for exploring the world of Barleywines, this would be an excellent choice. Note: While the review above is being posted in 2010, the tasting notes contained within were taken when the beer was fresh in 2009.